An experienced canoeist has died after becoming trapped against a tree in a swollen river on Dartmoor. Chris Wheeler, 46, from Reading, Berkshire, was in a group kayaking on the River Dart, near Poundsgate, on Saturday afternoon. Two other people were treated for mild hypothermia, following a large-scale rescue operation. The stretch of river where the accident happened is known by canoeists as the "mad mile". Fire, police, ambulance, Dartmoor Rescue and a Sea King helicopter from RMB Chivenor were involved. The river was in spate, providing challenging white-water conditions for experienced canoeists. Heavy rain and gale-force winds made the rescue operation hazardous in a remote location. Fire crews - supported by rescuers from Dartmoor Rescue - walked five miles over the difficult terrain to reach the scene. 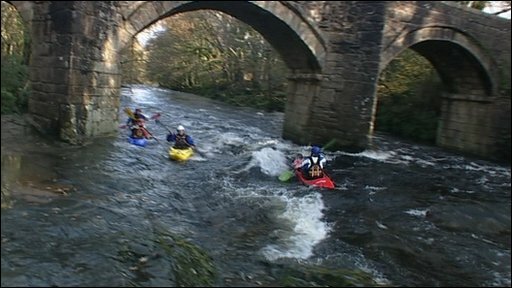 Robert Steemson, head of recreation, rangers and estates for Dartmoor National Park Authority, said the eight-strong group had been experienced canoeists. "The bit of river between Dartmeet and Newbridge is one of the best bits of river in the country," Mr Steemson told BBC News. "You have to be a very experienced canoeist to go down on that piece of river." Mr Wheeler was a contributor to Canoe and Kayak UK magazine, which said he had 25 years' experience as a "paddler" and had canoed all over the world. He was nicknamed Magic Knees - after dislocating his knees on Conwy Falls more than 20 years ago. 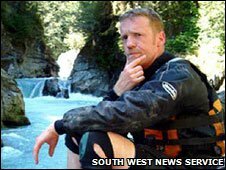 Robert Illman, the controller of Dartmoor Rescue, said the "notorious" stretch of river where the canoeist died is one of the most challenging in the country. He said the team had carried out at least eight or nine rescues over the past 10 years on the same stretch. Heavy rain had lashed the area on Saturday and the Environment Agency had issued a flood warning for the River Dart. There are also warnings and flood watches on a number of other rivers in the South West.